Hands down, this is one of the most incredible Kenner pieces I've ever laid eyes on; and I'm incredibly jealous of Rob for having it :^). 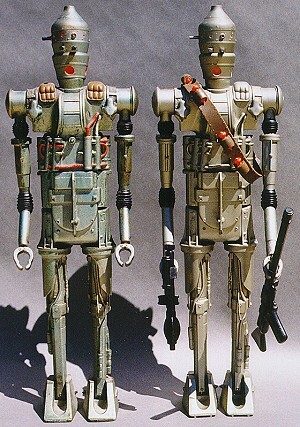 The piece is a fully-assembled hardcopy of the large IG-88 action figure; in some ways, its comparable to the one shown here. 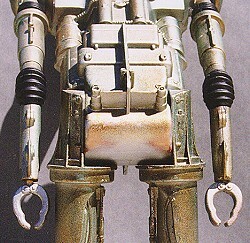 But, not only has this example been painted, its been detailed like no other pre-production piece I've ever seen. 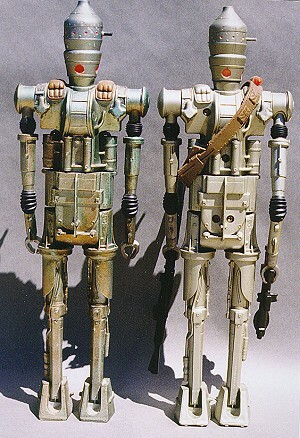 As you can probably see from the photos, certain details, such as the droid's "leather" shoulder pads and its many exposed cables, have been painted appropriate colors, an alteration which causes them to stand out and adds to the visual appeal of the piece. But the detailing doesn't end there. That rusty speckling you might be able to notice over the surface of the silver paint isn't actual grime; whoever painted this thing actually went through the trouble of weathering it, making it appear worn and used, just like the movie prop that probably served as its model. The back of the piece is no less impressive. Here you see the hardcopy (left) side-by-side with the production figure. Notice that the hands of the two figures are different: the production toy features an extra piece of plastic at the point where the hand meets the wrist. From a look at the backs of the two figures you'll notice that, predictably, the hardcopy lacks the molded holes of the production toy, which allow for screws to hold the two injection-molded torso halves together. Such details would have been cut into the production molds independently, and were not incorporated into the master sculpting for this piece. Seriously, this shot shows the putty used to fill in casting holes that must have occurred at the bottom part of the torso. A high degree of care and precision must have went into finishing this thing and putting it together--each joint had to function smoothly, and all flaws had to be carefully filled and sanded out. The construction of this piece is somewhat unique among the hardcopies I've seen. The torso was actually cast in two separate pieces, which were then glued together around pegs set into the head and each limb. Unlike many hardcopies, it cannot be easily disassembled. I've never seen another hardcopy which approaches the intricacy or beauty of this IG-88 piece. While most painted hardcopies are either paint masters or display models, painted to match the deco schemes of the production toys exactly, this one quite obviously looks very unique. Moreover, the modelmaker who put this together must have been fully aware that the project over which he was laboring would look a good deal different when finished than the toy which would eventually be sold in stores; there is just no way that Kenner could have hoped to produce a figure with such a detailed paint job, especially using the early-80s technology they were saddled with at the time. Its quite likely that this hardcopy was created as a presentation piece, intended to be submitted to Lucasfilm for the purpose of approval. Since making an impression was of the utmost importance in such an endeavor, the modelmaker might have taken liberties in painting this thing, and done his best to make it look all-out incredible. Well, if that is indeed the case, then he did a good job: this thing is gorgeous.